NEW DELHI, India (CNN) -- Indian Prime Minister Manmohan Singh took the oath of office Friday for a second consecutive term after winning a mandate for his Congress party. 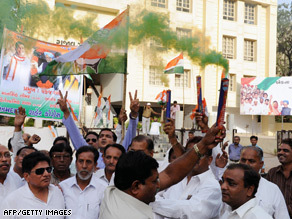 Gujarat Pradesh Congress Committee members celebrate the inauguration of Indian PM Manmohan Singh Friday. President Pratibha Devisingh Patil administered the oath of office to Singh, seen as architect of India's economic reforms in the 1990s. Among them was Mamata Banerjee, a fiery woman leader who dealt a severe blow to communists in their stronghold state in eastern India in the monthlong general elections. Tell us what you think. What does the future now hold for India? The swearing-in ceremony took place at the sandstone presidential palace in New Delhi. The Congress party, headed by Italian-born Sonia Gandhi, won 206 of 543 boroughs in the April and May general elections. That is its best performance in almost two decades that mostly saw coalition governments running the country. But the Congress party did face hiccups as it prepared to reclaim power. The party's talks with a key ally from southern India, over ministerial positions, fell through. But there was no immediate threat to the survival of the new government. The alliance partner, the Dravida Munnetra Kazhagam, says it will nonetheless extend outside support to the government. That means none of its lawmakers will be part of Singh's new council of ministers -- at least for now. An expansion of the Cabinet will take place in the next few days, the prime minister's office said. "This expansion will give due representation to allied parties," it added in a written statement.